Please arrive 1 hour prior to your lesson reservation to allow for lesson check-in and instructor assignment. Please note, on weekends and holidays we highly recommend arriving more than 1 hour before your lesson reservation for your check-in convenience. Please select a lesson program for anyone ages 13 and up from the options below. Be sure to review the lesson level descriptions, what to bring for your day at Dodge Ridge and the rescheduling and cancellation policies. There will be no refunds due to weather or snow conditions or for those who are unwilling to participate in the class. You must call (209) 965-3474 to reschedule or cancel reservations. All Kids Club 5 – Pack, Progression Pass and Summit Pass Lesson Passes are subject to these rescheduling, cancellation and non-refundability policies. Packages Include a 2 hour lesson, rental equipment + helmet and day pass as described below. Adult & Teen lesson times are 10:00am & 1:00pm. Lesson Reservations are available online for the lesson options below. All prices subject to change without notice. All sales are final. Same day lesson reservations are not available by phone or online and are only available on a first-come, first-served basis in person from Guest Services in the Family Lodge. *Gratuities for instructors are not a requirement, but an appropriate and appreciated gesture. THE FOLLOWING DESCRIBES THE SKILL LEVEL OF THE STUDENTS ENTERING EACH LESSON LEVEL, AND A LIST OF SKILLS TAUGHT IN EACH SPECIFIC LESSON. This will allow for enough time to check-in in the Family Lodge and then get fitted for your equipment in the Rental Center. Helpful Tip: You can arrive at Guest Services for check-in as early as 7:30am on weekends and holidays and as early as 8:00am on weekdays (non-holiday). Guests may check-in early for Afternoon 1pm lessons in order to pick-up lift tickets and to get rentals fitted for use prior to their lesson. Helpful Tip: While checking in for your lessons, you can purchase everything needed for everyone in your party from our Guest Service representatives, including day passes, rentals, additional lessons, etc. Helpful Tip: Your most convenient parking will be located as close to the Family Lodge as possible. If you find that you’re running behind schedule, a member of your party can get dropped off in the unloading zone directly in front of the Family Lodge to get in line for check-in, while the rest of your party locates the desired parking and gathers up their gear. On weekends and holidays, daily preferred parking passes are available from the preferred parking lot attendants at our Base Area in front of the Family Lodge. Season-long Preferred Parking Passes can be purchased online prior to your visit (Parking passes can be picked up the day of your visit from Guest Services inside the Family Lodge. Fill out your lesson liability form (found on the wall displays at Guest Services inside the Family Lodge). These same forms are used for anyone purchasing rentals for the day. Take your completed form(s) up to the Guest Service Representatives. Helpful Tip: There will be a designated counter for guests with existing lesson reservations. they’ll direct you to the Rental Center (the next building over), where you’ll get fitted for your ski & snowboard rentals. Once you’ve gotten fitted for your equipment, you’ll meet your instructor and lesson out on the snow behind the Family Lodge. Look for the windblades indicating your lesson type (either Snowboard Lessons or Ski Lessons). You will be able to use your rentals and lift ticket (day pass) to practice for the remainder of the day. Helpful Tip: When taking lessons and renting equipment on consecutive days, it can save time on your check-in each day if you have our rental staff keep your rented skis and snowboards reserved for you overnight. This will help avoid the need for refitting equipment each day. Helpful Tip: Gratuities for instructors are not a requirement, but an appropriate and appreciated gesture. Once you’ve conquered levels 1 – 3, take advantage of exclusive upper level lesson package discounts for only $80 per lesson (level 3+ up to expert). You’re guaranteed to learn in our specially designed Progression Pass program. This premier lesson package introduces newcomers, ages 13 and above, to skiing & snowboarding, turning participants into accomplished skiers and riders. We make learning easy as you progress at your own pace through levels 1 – 3. Each pass is specific to either skiing or snowboarding for the 2018/19 season (you must select ski or ride at time of purchase). Progression Passes are specific to either ski or snowboard. You must select ski or ride at the time of purchase. (10) Rental packages + helmet for days when not taking a lesson. This is in addition to the rentals + helmet you receive with each of your (10) lesson packages. Once you’ve conquered levels 1 – 3, take advantage of intermediate to advanced (levels 4 – 6) for only $80/each (regularly $148). You must call (209) 965-3474 to reschedule or cancel reservations. All Kids Club 5 – Pack, Progression Pass and Summit Pass Lesson Passholders are subject to these rescheduling, cancellation and non-refundability policies. Advance your skills to the next level on all-mountain terrain. Our Summit Pass program comes with (4) upper level lessons (levels 4, 5 and 6) lesson packages, giving you the tools you need to become the Skier or Rider you aspire to. Your Summit Pass also comes with a 2018/19 unlimited, all-mountain Season Pass, providing access to all 1,600 vertical feet of Dodge Ridge. Summit Passes are specific to either skiing or snowboarding for the 2018/19 season (you must select ski or ride at time of purchase). Summit Passes are specific to either ski or snowboard. You must select ski or ride at the time of purchase. Rental equipment + helmet included with each lesson. 1. Claim your Ski+Ride with Friends (S+RWF) lift tickets perk. As a 2018/19 Season Passholder you will have the opportunity to purchase 4 discounted Ski+Ride With Friends (S+RWF) day passes. S+RWF day passes are not available during Holiday black-out dates (December 26, 2018 – January 5, 2019; January 19 – 20, 2019; February 16 – 17, 2019). S+RWF day passes may be redeemed in any quantity per visit with a maximum of 4 available for redemption during the 2018/19 Season. Dodge Ridge Season Pass must be present to receive all benefits. Swipe your pass for the All-Season-Long Sport Shop 20% Discount. This discount is good for 20% off regular price, in-stock hardgoods and apparel (excluding accessories) throughout the season (not including services). Be the first to hit the powder on First Tracks days! Three times during the season, Dodge Ridge will open the lifts early for 18/19 Season Passholders ONLY (non-passholders may ride the lifts early if accompanied by a Season Passholder). First Tracks Days are weather dependent, and the weather can be unpredictable and quick-changing in the mountains. Dates for First Tracks Days are commonly released 24 – 36 hours in advance, so be sure to sign up for Eblasts and Powder Texts (Text the word “Powder” to the number 62687) as well as liking Dodge Ridge on Facebook to ensure you never miss an epic First Tracks Day. As an added benefit for our 2018/19 Season Passholders, we have FREE Demo Skis (Subject to availability) for our 2018/19 Passholders to test out on those First Tracks days all day long . Contact the Sport Shop for additional information (209) 536-5348. Bring one lucky friend or family member to redeem (1) day pass of equal or lesser value of the paid passholders’ age category. Dodge Ridge Season Passholders can test out the entire fleet of skis from the Dodge Ridge Demo Center at a discount during our Annual Demo Day on (TBD). Season Passholders who attend our Labor Day Winter Kick Off event will receive a FREE T-Shirt. Limited supplies available, shirts left over from the Labor Day weekend are available on a first come first serve basis while supplies lasts. Reservations are highly recommended prior to your visit. You must call (209) 965-3474 to make your Summit Pass Lesson Reservation. This exciting program for intermediate to advanced skiers over the age of 50 will be geared towards the technical elements necessary for their success. Our specialized Master’s Instructors will guide everyone through efficient progressions for establishing a strong body position on skis while allowing for the least amount of resistance on our muscles and skeletal frame. The Masters Program is a must for those anxious to improve in a relaxed atmosphere, meet new friends and develop the skills and techniques to keep skiing for years to come! Give us a call at (209) 965-3474 for more info or to sign up for the Masters program now! Reservations are highly recommended prior to your visit! 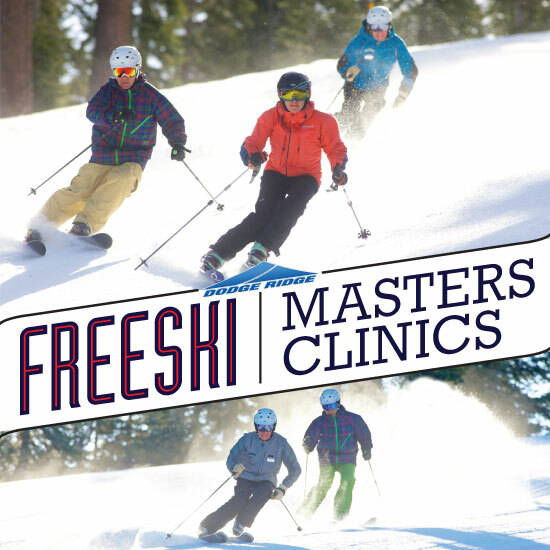 Please call (209) 965-3474 to make your Master’s Clinic reservation. All prices subject to change without notice. All sales are final. Lessons available for date indicated. 3 Packs of clinic are for single person use and may not be shared or transferred.